It took me a while to finalize this model but I was busy on my building desk the last couple of weeks. 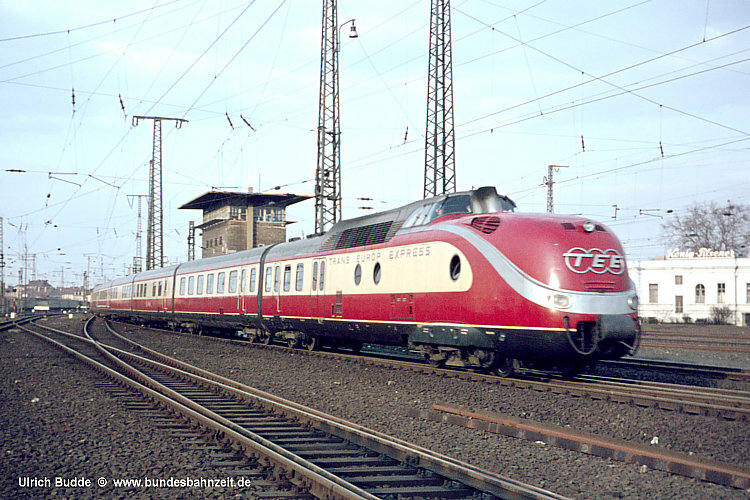 It started all with the idea to use two Brick, Round Corner 3 x 3 x 2 Dome Top for the characteristic nose of the engine units. A much bigger challenge were the grey-silver stripe which swings from the lower front lights up to the driver's cabin. For a long time I favoured a solution using rigid hoses, but it didn't work out and the hose did not "swing". So I ended with the plate variant, at least I did not build any steps. I also realised the round bull's-eye windows. The first one has to be located as close as possible to the end of the tan section. So the arched brick helped here. We still miss an element which fits between the 1 x 3 x 2 arch and the larger 1 x 6 x 3 arch. But I found a solution using curved solpes covering most of that gap. I am still stuggling with the right colour of the roof section behind the driver's cabin. Originally it should be light bluish grey (same colour as the stripe). But in real live all the grime from the exhausts makes this roof look more dark/dirty. So I also build a dark bluish grey variant. Both can be swaped easily and this feature allows easy access to the rechargeable battery box. Which colour do you prefer for this roof section? More pictures in various sizes on Flickr! Very nice build with lots of good and unique building techniques. How do you drive the 3 PF train motors to be synchronised? All of them ar plugged on the same IR receiver or you have more receiver and battery packs? 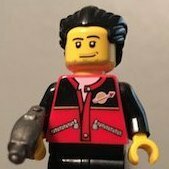 If it is 2,5 metres long, one IR receiver with 3 train motors can't make it move due to current limitation, so maybe two IR with 2-2 motors gives better traction, OR non-LEGO SBrick. Wow!! Pinch me. Am I dreaming? We’re seeing some great stuff this week. It feels like we’ve won the lottery. This is just tremendous!! 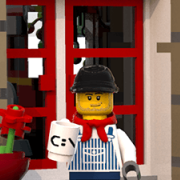 I saw a sneak preview on Flickr and I had to look twice to make sure this really was LEGO. But then I saw your name against it and it all made sense. With experimenting with different, long, any heavy train I found that on longer term or running the train on strict R40 based station geometry it generates issues that the train drives assymetrical - direction A pushed, direction B pulled. Of course we know tons of MOC-s with loco-car-car-drivercar setup, where the full trainset is pushed in one direction, but the forces awakening at the coupling magnets and the magnets' suspension to the bogies are really different in pulled and pushed mode. I think a second V2 IR and two motors under rear engine (or the same with 2 SBricks) will give better and smoother run. Wow- such a great build! Nice parts usage and techniques; I'm really impress with how well the front of the engine came out. Great integration of the PF and lighting as well. Thanks also for sharing the additional detail on that above. There are so many details that I don't know where to start ...first of all the bogies: I like how there are outer covered and builded also with the grilled tile that seems a ladder. The roof of the wagons has a beautiful curved profile, and those expensive old school train windows and the tan colors do justice to this train! 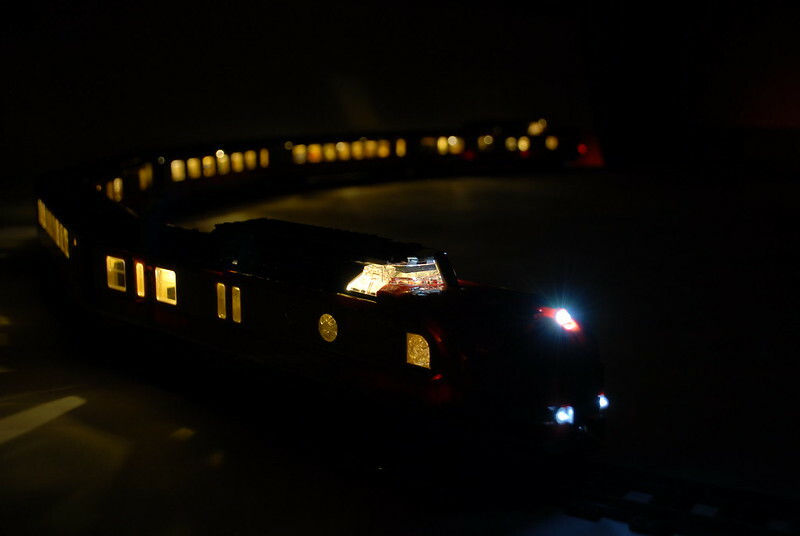 I like the porthole with the upside down arch and the whole convoy in the night with the inner lights! The roof colour that I prefer is the ligh gray one: as the original train is just come out of the factory ...moreover that light gray colour is perfectly integrated with the diagonal strip on the nose! Really nice Holger, I already spotted it at 1000steine :) I also like the inner lights, did you make those custom or use some small Christmas lights? Now if we only had more Dark Red it would become even more realistic. I guess we will need to wait a little longer for that. Amazing! I've never really comented on any train thread but the TEE is an absolute favourite of mine an I coudn't help. 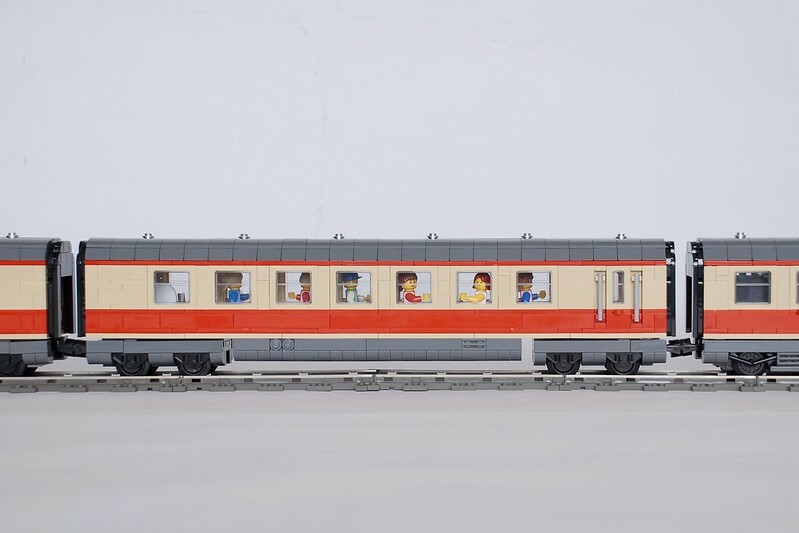 On a first look, it felt like I was seeing a Marklin model (definitely a good thing) and then as I scrolled down and read to how many lenghts you went to cover up all the gaps and integrating all the windows, I just fell in love. I really like the way you did the front of the train. Lights and interior of course is also great. 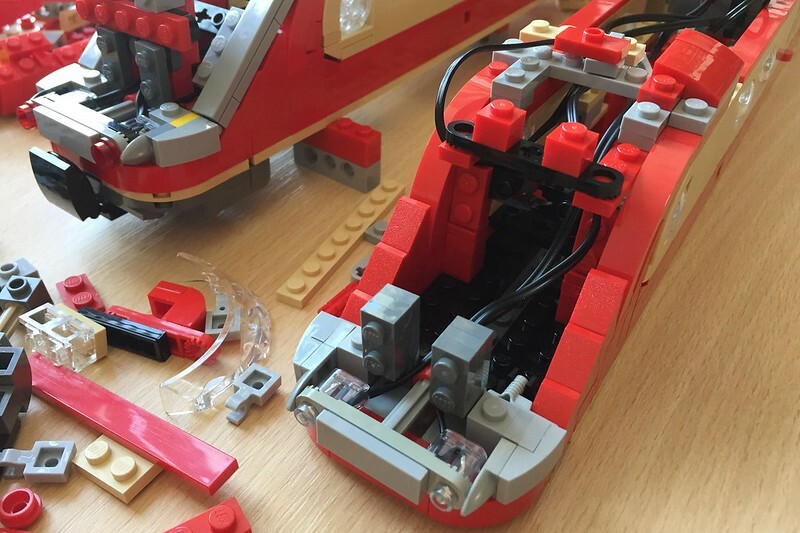 As a train, it's not my cup of tea, as I'm not familiar with the design, but wow, I can really see the skill and level of detail that has gone into the build. Such a top job! Really nice work, Holger! I rather like the sleek design, and really nice use of parts throughout the entire build. (Which reminds me, I need to see about buying your book in the near future). I'm in love with that TEE! This is a so iconic train and you really managed to get it! Soft curves, good lenght, nice detailing... what else? It's beautiful - I love the softly curving bulbous nose and the stripe you integrated into it, as well as the transition from red to tan. 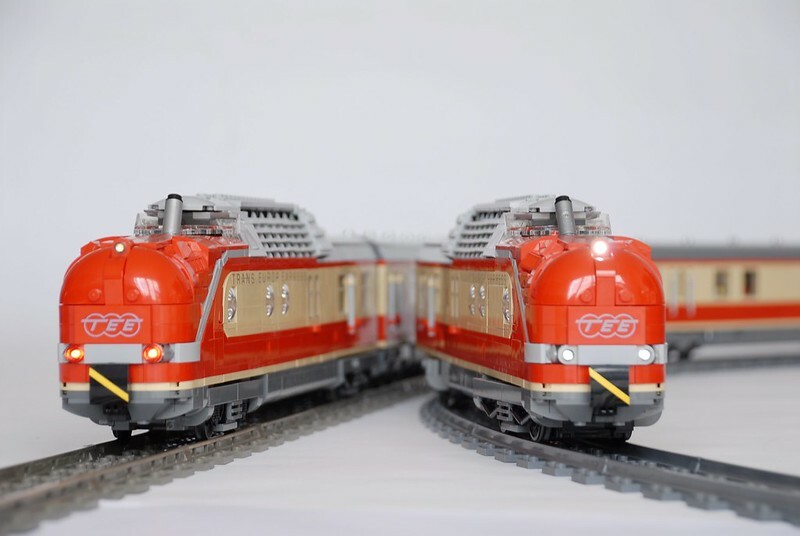 An amazing build of an amazing train. Incredible work getting all of those difficult curves (nose up, nose down, roof, transition to the cab, you name it). 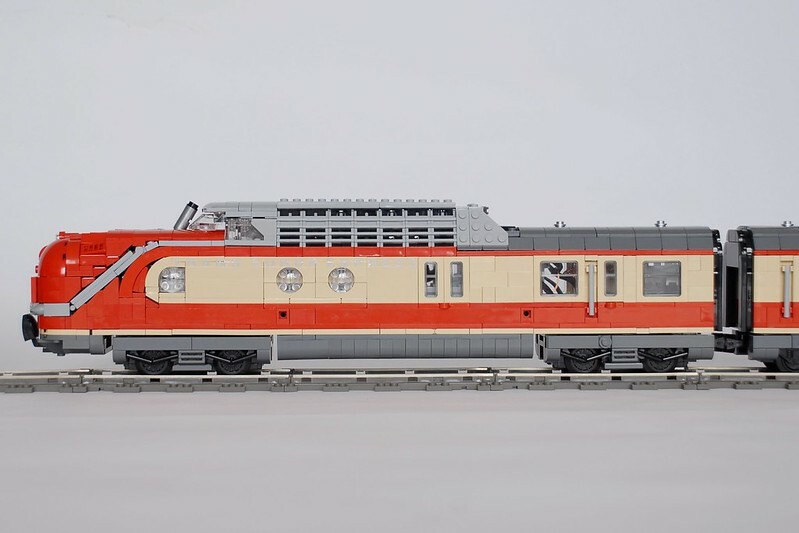 I too prefer the light gray cab, and would add that if you wanted the cab to look dirty that all of the shiny clean bricks over the rest of the train diminish from the "just finished my 10th round trip without a bath" illusion. 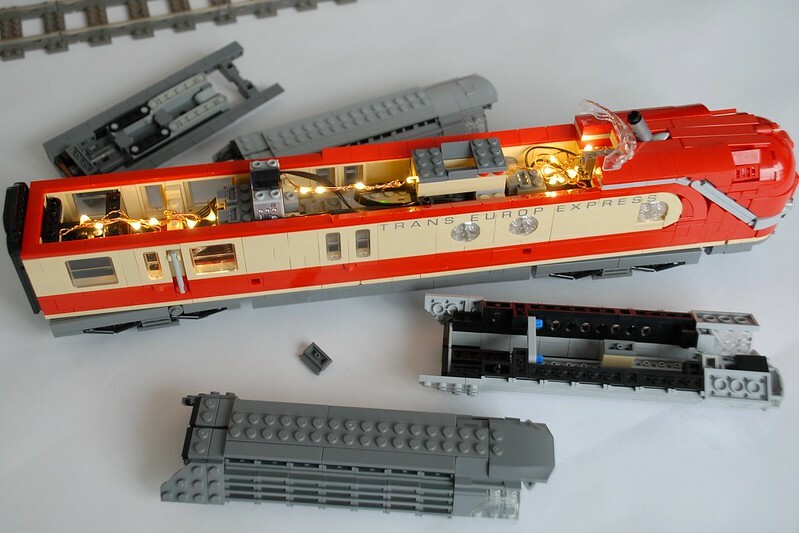 It is difficult to make lego look like a weathered train. One thought for the cab, are you aware of some of the new modified tiles that could be used in place of the studded wedge plates at the rear of the cab/engine bulge? 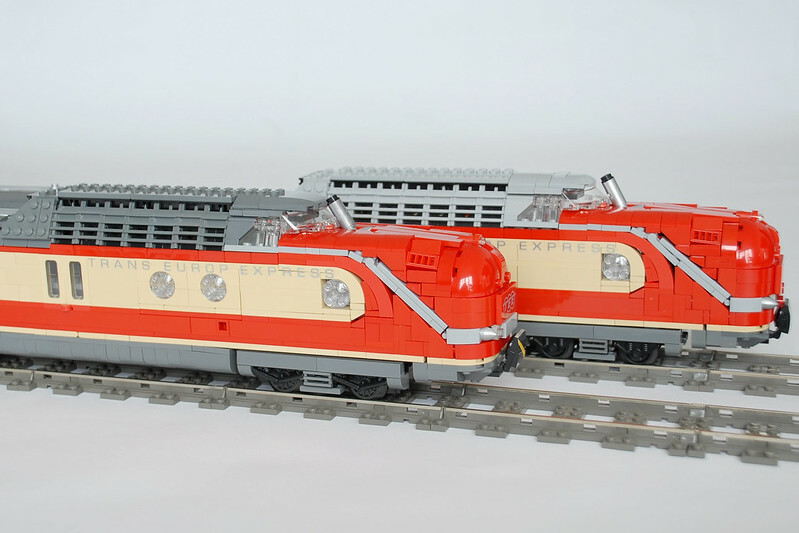 This is an excellent rendition of the classic TEE train set. As a builder of 7 wides, I believe this is the best MOC in the size I have seen. All the detail work is top notch and how you made it all fit is incredible. Wow, that's a beautiful model. So clean and realistic looking. Brilliant and congratulations on having your model front paged. Love the way you've built the curved, streamlined shape of the front of the locos. This is another brilliant design. Amazing. TEE … the colors … the curves … the head lights … the sleek look … the ads they produced these days … it is all coming back - in full swing. 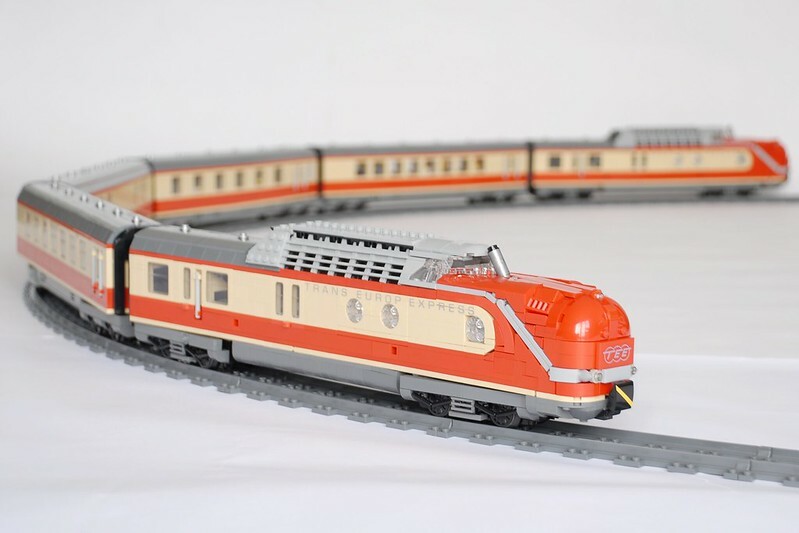 I always thought that the BR 103 in that color scheme (I am color blind, but I believe it is the same color scheme, at least to some extent) was one of the the most beautiful LEGO engines (I saw) of the days after steam. 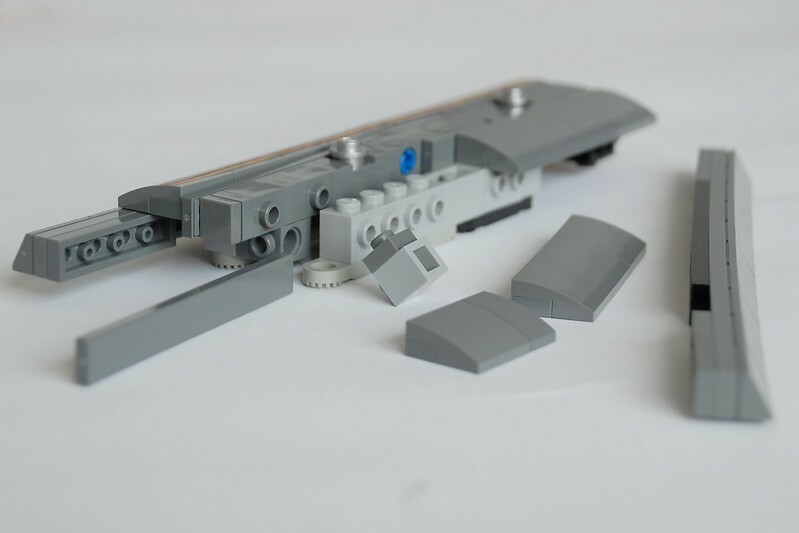 I never believed that the BR VT 11.5 could be rendered with LEGO bricks in a way that it actually would catch. I was wrong. 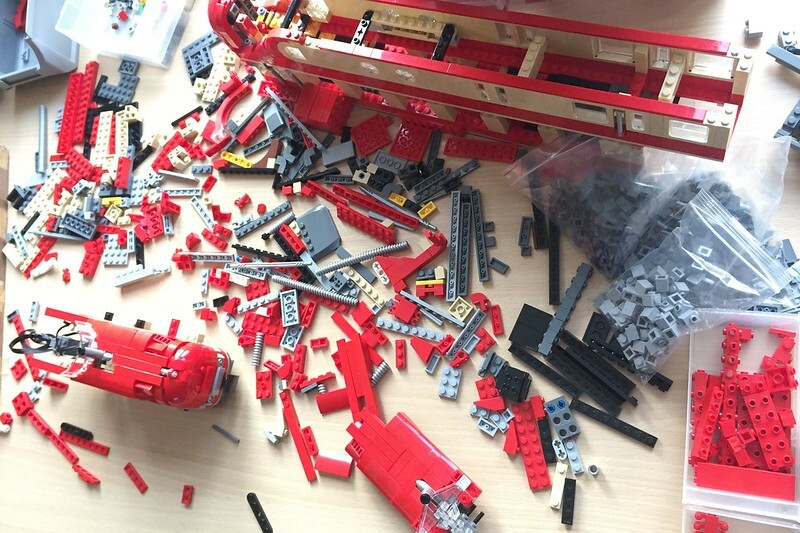 If there were another book you authored, the title could be: "LEGO BR VT 11.5. All you wanted to ask about outer space building skills". Below the title, the first photograph in your post and below that "Don't panic". You told me that you were excited about this project a couple of weeks ago. Believe me, I truly understand now. I thought it was the 2.5 meters and all the tricks you need to make such a train running smoothly on L-gauge. So wrong. 2.5 m / 6 = roughly 42 cm, assuming cars and engines are about the same length. Well. In essence this means that you found The Answer. In contrast to these folks facing Deep Thought, you also know the question - and we know all the implications that has - "What is the length of the most beautiful train ever seen, divided by 6?" Holger, for me this is brick building from another world. Not another level. I'd like to finish with what I have learned from @Man with a hat: Tipping hat, slight nod … and I would like to add, a deep bow. Very nice build, the SNOT work is superb! will we see it running? Regarding the color issue, I would stick with the silver top on the power cars as that is how they were painted. If you want to add a weathered look, you could replace some of the foremost silver/light blueish gray pieces with dark grey to give it a sooty feel.